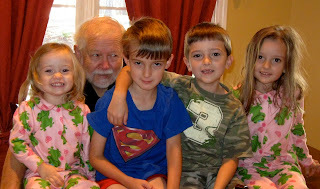 Baboo and I were a little under the weather during a recent jaunt to Columbus, GA, to keep the Fab Four grandkids while their mom and dad were out-of-town. The first morning that we had them on our own we did pretty well with making sure they were dressed, hair neat and ready for the day. By Sunday morning, though, our energy had fizzled and house rules slid by the wayside. The sequence of events following an exchange between Baboo and two-year-old Stella left no doubt: The slide was complete. I heard Baboo tell Stella that putting her feet on the table was not allowed. As I passed by the table a little later, Stella was IN THE MIDDLE OF THE TABLE, laughing at some grandpa-granddaughter game they were playing. When I came back through the room again, the table held the entire Skupien brood. All four were in motion as Baboo induced mock terror and shrieks. 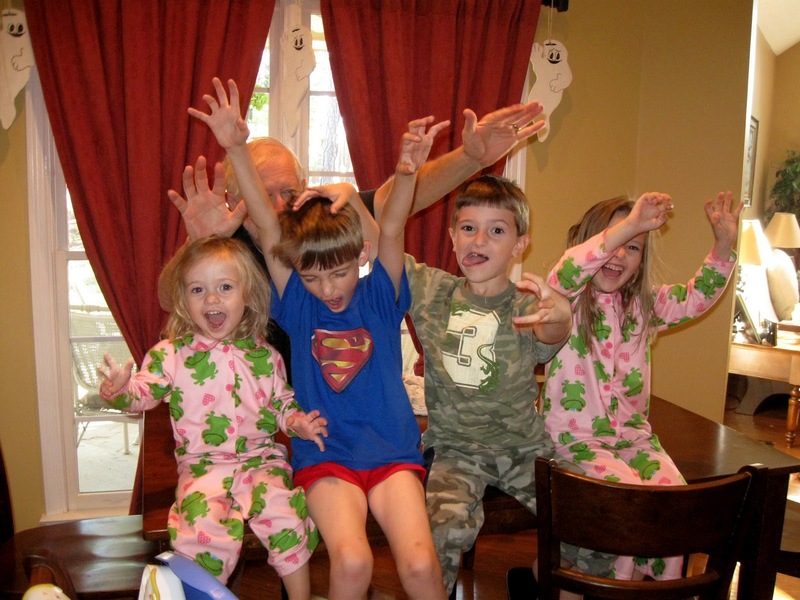 When mom and dad returned home about 1 p.m., kids were still in their sleepwear, hair in disarray. But fizzled or not, grandparents had had a blast. Grandkids had fun, too. love these pictures of my sweet nieces and nephews! Seeing these pictures makes me miss them so much - hopefully we will see them soon! So glad ya'll had a good time with the Fab Four!! Hope you are ready for a few days with our two. MK is so excited about a visit with you and Baboo! !